Home » How to Help? Category Archives: How to Help? Sweet little Ky was rescued by one of our foster care providers. He needed vet care and to be neutered. He was around 6 years old then. Ky went to live with a Brian. Ky became Brian’s faithful companion and was loved and will be missed and remembered forever. 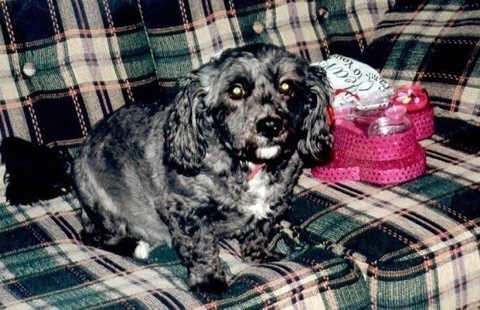 I’m sure Ky is curled up in heaven comforting someone who may have gone before their beloved pet. Special thanks to Brian for donating In Memory and for especially opening up his home and heart to another senior dog, Kobe. A kind and thoughtful donations was made In Memory of Brian McKinley Brown of New Harbour, Trinity Bay, Newfoundland by Ms. Kimberly Ann Brown and her parents, George and Bertie Brown. Mr. Brown passed away suddenly at the age of 79 on October 13, 2011. According to Ms. Brown, Mr. Brown loved and respected animals and over the years helped many. This donation goes directly to helping animals through our spay/neuter program. 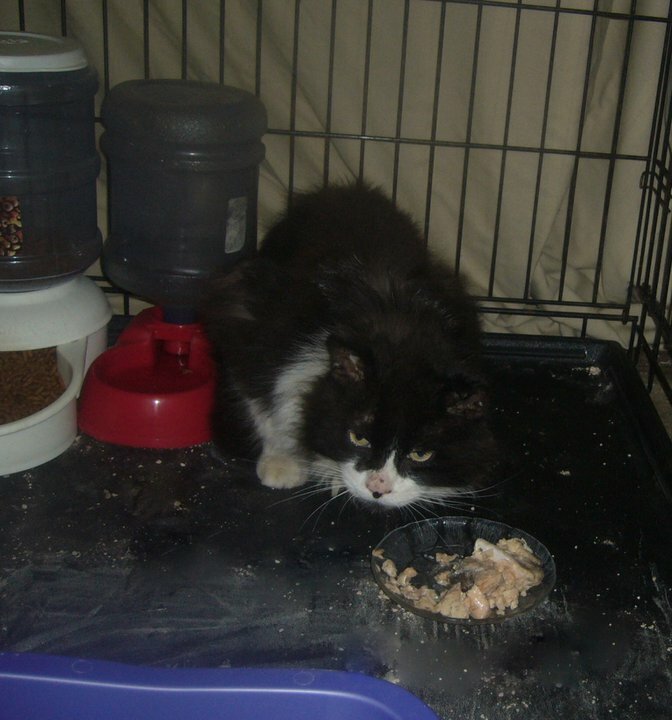 BO – a feral who needed help. 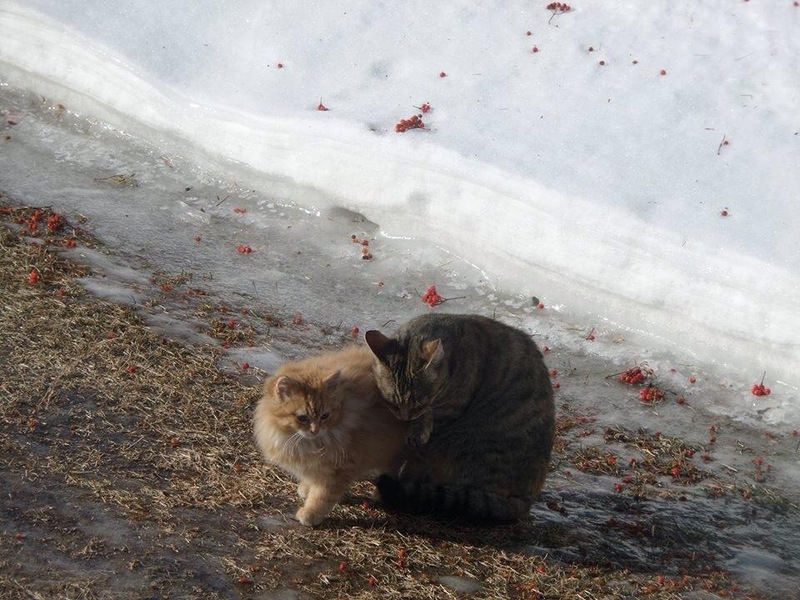 Last winter we received reports of a injured cat roaming between Riverview Motors, Carmelite Road and Lincoln Road area (by the Curling Club) in Grand Falls-Windsor. We had volunteers set out food at various locations and sent out pleas for everyone to keep a eye out for him so we could trap him and get him checked out. THANKFULLY he turned up at one of our volunteer’s. We borrowed a trap from the Town of Grand Falls-Windsor and our volunteer started monitoring the trap. We had to make sure we had him so we could book a appointment, we had already given the clinic a heads up that we were working on this cat. THANKFULLY our volunteer caught him. Now he had to get isolated so we could make our appointment. We arrived with a dog crate and set up her shed for recovery, as he also needed 10 days to recover and then if we had to he would be released and monitored … if he was able to be saved. We didn’t know what condtion he was in. Thankfully the weather was cooperating and it wasn’t too cold outside. He was checked out by Dr. Pike at the Exploits Valley Animal Hospital. It was discovered he wasn’t injured as we had suspected, he was so badly matted that his fur had torn off. He was combed out, cleaned up, tested, dewormed, treated for ear mites and flea prevention and given rabies and general vaccine and neutered. He recovered in the shed. Sadly once he finally was well enough he wanted OUT … Bo is being monitored and fed. We are currently working on his winterized shelter and feeding station and have almost all the supplies for that. Donations are being accepted to help with BO. For his maintenance, we help when we can with food (good quality food) and we need a few more items for his shelter and we hope to retrap him in the spring for boosters and a check up. Posted in Ferals Need Your Help!!!! A handsome young tom cat started showing up at one of our member’s home back in September. Helen, who has rescued many animals over the years, spent time getting to know this young kitten, feeding it and gaining his trust as he was pretty timid. Shortly after Christmas she finally managed to nab him and got him inside. We booked his appointment for feline leukemia test and had him neutered and he is recovering nicely. We recently visited with Helen and Spin. Spin turned out to be a wondering cat, very affectionate. It took a lot of love and patience. Only goes to prove that feral cats can be tamed. Posted in 2nd Hand Paws, Ferals Need Your Help!!!! Special thanks to the people who work with Trevor Kelly who donated in memory of his father, Tom, who recently passed away. He will be missed by his family and his special companion Jada.